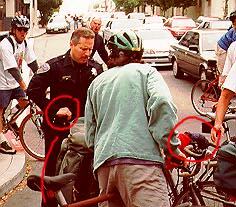 Note the position of the cyclist's backpack (indicates cyclist is on his knees) and the curve of the policeman's visable hand. It appears as if he grasping a cylindrical object of small diameter. The cyclist's hand is visible at right on the handle bars. 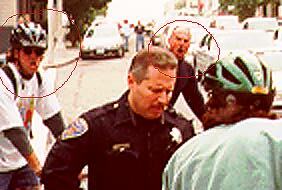 The reactions of the onlookers. Note: The original photos are much clearer. 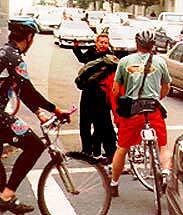 As always, we are seeking photos of police attacks on cyclists and pedestrians during the July 25th ride. Better late than never. All photos on this page copyright Paul Spinrad, 1997. Scans by E-Media.